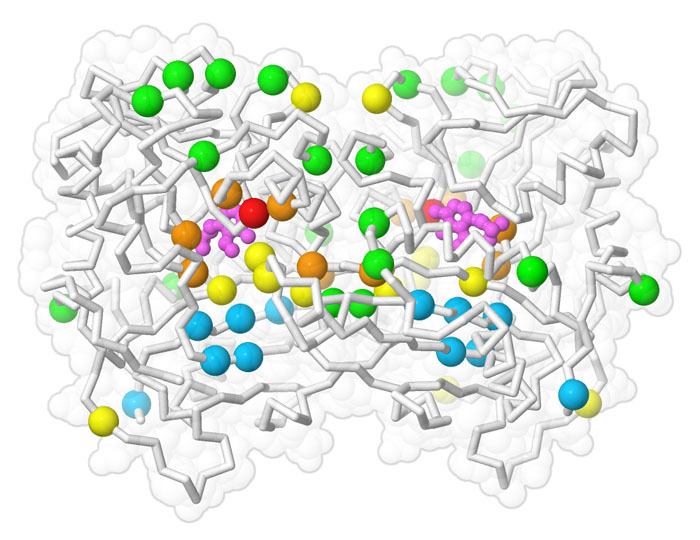 An evolved P411 enzyme, with sites of mutation shown with colored spheres. Sites in red were selected first, followed by orange, green and blue in successive cycles of evolution. Darwin’s conception of biological evolution combines two different processes. First, there needs to be a process that generates many random variations in a population, such as genetic mutation and recombination. Second, biological evolution is given direction by natural selection, through the popular concept of “survival of the fittest.” When these two processes are combined, selection of the best individuals over many generations leads to evolution of better and better characteristics. Today, scientists are using the same evolutionary process in the laboratory to solve difficult challenges. Frances Arnold, a winner of the 2018 Nobel Prize in Chemistry, pioneered the use of evolution to create enzymes with entirely new functions. This works much like biological evolution, but with some direction from the scientist. The whole process begins by finding an amenable "parent" enzyme, often one that weakly performs the desired reaction or a similar reaction. Then, the parent enzyme is mutated, often at sites that are informed by the 3D structures of the protein, to create many random variants, and they are tested for the desired activity. The best performers are then selected, and subjected to additional rounds of mutation and testing. After many cycles, an evolved enzyme with the desired new function wins out. The enzyme shown here, from PDB entry 5ucw, is a product of directed evolution. It performs a tricky amination reaction that is not performed by any natural enzymes, and that requires precious metal catalysts (such as rhodium, ruthenium or iridium) when done in industrial settings. 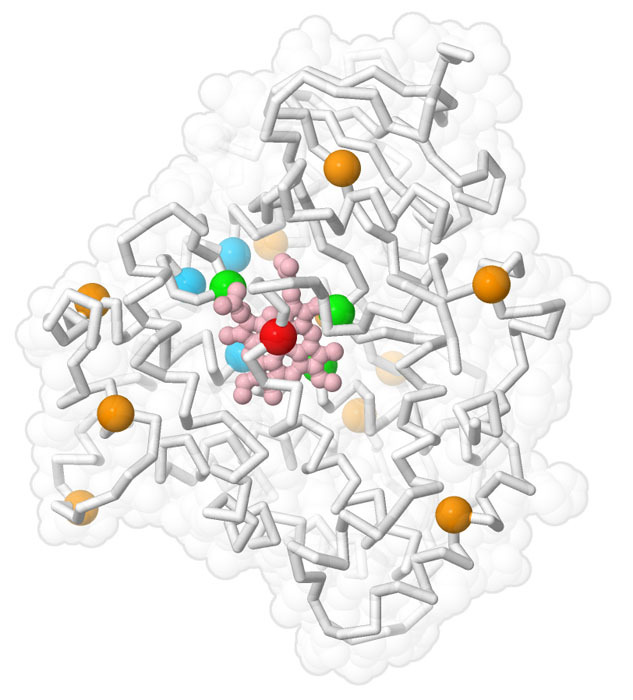 The directed evolution began with a cytochrome P450 enzyme. A new serine was added to coordinate with the iron atom, and then many additional changes were selected to tune the types of reactions that it performed. The result is an environmentally-friendly enzyme that doesn’t require metal catalysts, and is highly selective for the desired reactants. An evolved sitagliptin-producing transaminase enzyme, with sites of mutation colored similarly to the illustration above. Directed evolution was also used to evolve an enzyme to create a tricky intermediate molecule needed to make the diabetes drug sitagliptin, to replace the traditional chemical synthesis method, which requires high-pressure hydrogenation using a special rhodium catalyst. The new enzyme was evolved in 11 steps, first tuning the reaction, then tuning its ability to function under industrial conditions, with organic solvents and at higher temperature. The result is the enzyme shown here (PDB entry 3wwj), which creates a very pure product, requiring fewer purification steps and using a much more environmentally-friendly process. 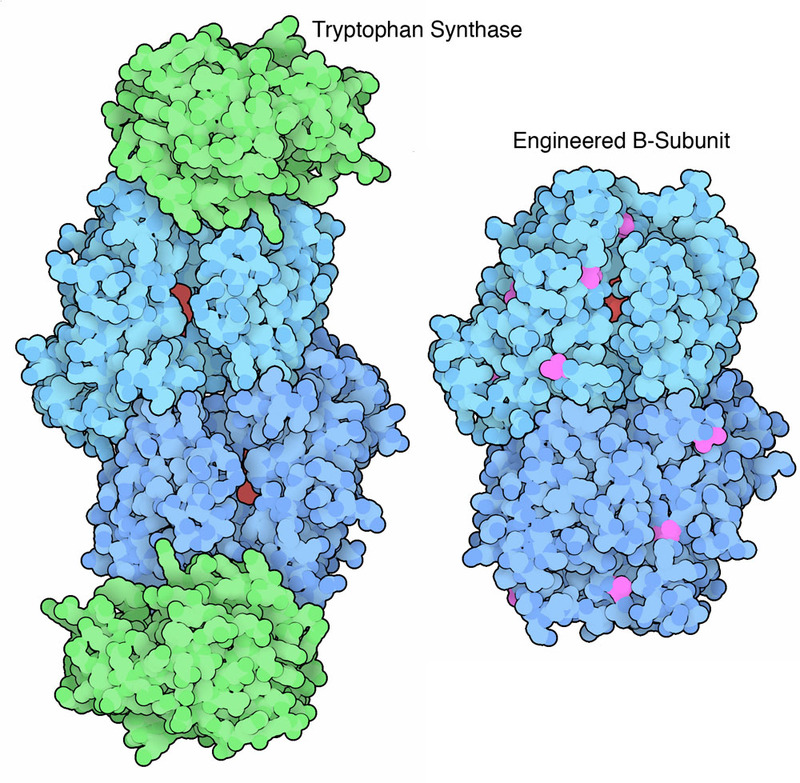 Tryptophan synthase, with A-subunits in green, B-subunits in blue, and substrates in red. The engineered B-subunit is shown with with sites of mutation in magenta. Twenty types of amino acids (plus a few variants) are used to build most natural proteins, but we use many other types of amino acids to construct new drugs and molecular probes for biological research. The enzyme shown here (PDB entry 6am8) was engineered to create modified forms of tryptophan. Directed evolution was performed in several steps starting from the natural enzyme tryptophan synthase (PDB entry 1wdw), which contains two types of subunits that perform two different reactions. First, the central enzyme (the B-subunit) was modified to work without the other enzyme (the A-subunit). Then, additional mutations were evolved to change the chemical reaction it performs. Structural study revealed that the mutations are scattered throughout the enzyme, showing that they change the flexibility of the enzyme, rather than interacting directly with the desired substrates in the active site. Directed evolution has also been used to tune biochemical pathways in cells. For example, the Arnold lab modified the pathway for production of isobutanol, a second-generation biofuel. Two of the enzymes in the isobutanol production pathway, alcohol dehydrogenase and KARI, use the cofactor NADPH. However, the similar cofactor NADH is much more prevalent in these cells, since they generate much of their energy through glycolysis. So, Arnold and her team used directed evolution to modify the enzymes so that they can use NADH instead of NADPH. For alcohol dehydrogenase, variants that use NADH are found in other organisms, so one was engineered for optimal function in this pathway, but for KARI, the entire enzyme needed to be evolved to switch its preference from NADPH to NADH. A similar cofactor shift was engineered into the related KARI enzyme shown here, with the original enzyme on the left (PDB entry 4kqw) and an evolved NADH-dependent enzyme on the right (PDB entry 4kqx). Click on the image to explore these enzymes in more detail. Many other examples of directed evolution, both for enzymes and for other proteins, are available in the archive. Try searching for “directed evolution” to see some of them. See other examples of molecular evolution in the new Browser topic on Molecular Evolution. Arnold, F.H. Directed evolution: bringing new chemistry to life (2018) Angewandte Chemie International Edition 57: 4143-4148. 6am8: Buller, A.R., van Roye, P., Cahn, J.K.B., Scheele, R.A., Herger, M., Arnold, F.H. Directed evolution mimics allosteric activation by stepwise tuning of the conformational ensemble (2018) Journal of the American Chemical Society 140: 7256-7266. 5ucw: Prier, C.K., Zhang, R.K., Buller, A.R., Brinkmann-Chen, S., Arnold, F.H. Enantioselective, intermolecular benzylic C–H amination catalysed by an engineered iron-haem enzyme. (2017) Nature Chemistry 9: 629-634. 3wwj: Guan, L.J., Ohtsuka, J., Okai, M., Miyakawa, T., Mase, T., Zhi, Y., Hou, F., Ito, N., Iwasaki, A., Yasohara, Y., Tanokura, M. A new target region for changing the substrate specificity of amine transaminases (2015) Scientific Reports 5: 10753. 4kqw, 4kqx: Brinkmann-Chen, S., Flock, T., Cahn, J.K., Snow, C.D., Brustad, E.M., McIntosh, J.A., Meinhold, P., Zhang, L., Arnold, F.H. General approach to reversing ketol-acid reductoisomerase cofactor dependence from NADPH to NADH (2013) Proceedings of the National Academy of Science USA 110: 10946-10951. Savile, C.K., Janey, J.M., Mundorff, E.C., Moore, J.C., Tam, S., Jarvis, W.R., Colbeck, J.C., Krebber, A., Fleitz, F.J., Brands, J., Devine, P.N., Huisman, G.W., Hughes, G.J. Biocatalytic asymmetric synthesis of chiral amines from ketones applied to sitagliptin manufacture (2010) Science 329: 305-309. 1wdw: Lee, S.J., Ogasahara, K., Ma, J., Nishio, K., Ishida, M., Yamagata, Y., Tsukihara, T., Yutani, K. Conformational changes in the tryptophan synthase from a hyperthermophile upon alpha(2)beta(2) complex formation: crystal structure of the complex (2005) Biochemistry 44: 11417-11427.